(Nanowerk News) A new process for coating copper nanowires with graphene lowers resistance and heating, suggesting potential applications in computer chips and flexible displays. "Highly conductive copper nanowires are essential for efficient data transfer and heat conduction in many applications like high-performance semiconductor chips and transparent displays," said doctoral student Ruchit Mehta, working with Zhihong Chen, an associate professor of electrical and computer engineering at Purdue University. Now, researchers have developed a technique for encapsulating the wires with graphene and have shown that the hybrid wires are capable of 15 percent faster data transmission while lowering peak temperature by 27 percent compared with uncoated copper nanowires. "This is compelling evidence for improved speed and thermal management by adapting the copper-graphene hybrid technology in future silicon chips and flexible electronic applications," he said. 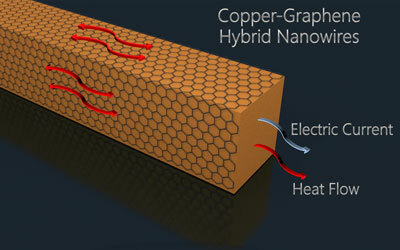 Findings are detailed in a research paper published online in February in the journal Nano Letters ("Enhanced Electrical and Thermal Conduction in Graphene-Encapsulated Copper Nanowires"). The paper was authored by Mehta, doctoral student Sunny Chugh and Chen. Researchers and industry are trying to create smaller wires to increase the "packing density" of electronic components in chips. However, while smaller wires are needed to increase performance and capacity, scaling down the size of the wires reduces electrical and thermal conductivity, which can lead to overheating and damage. The graphene coating prevents the copper wires from oxidizing, preserving low resistance and reducing the amount of heating. "If the surface is covered with oxide then a lot of the electrical and thermal conductive properties of copper are lost," Mehta said. "This is very important because you want as much current as possible going through these wires to increase speed, but they cannot take too much current because they will melt. But if the copper has good electrical and thermal conductivity you can push more current through it." The hybrid wires are promising for transparent and flexible displays because they could be used in sparse numbers, maintaining transparency, and they are bendable. "Copper wires usually aren't good for these displays because they eventually oxidize and stop working," Mehta said. "If you can prevent the oxidation, they potentially become a good fit." Until now it has been difficult to coat copper nanowires with graphene because the process requires chemical vapor deposition at temperatures of about 1,000 degrees Celsius, which degrades copper thin films and small-dimension wires. The researchers have developed a new process that can be performed at about 650 degrees Celsius, preserving the small wires intact, using a procedure called plasma-enhanced chemical vapor deposition. Wires were tested in two width sizes: 180 nanometers - or more than 500 times thinner than a human hair - and 280 nanometers.